Barry raises the bar again with his seven habits of effective magical entertainers. How do you build a better mouse trap? By thinking like a mouse. How do you build a better show? By thinking like an audience! 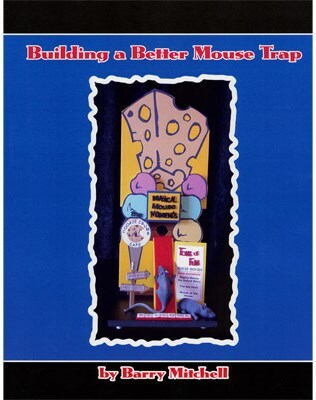 "Building A Better Mouse Trap" is volume II to Barry Mitchell's popular "Magic of Thinking Creatively" book. Magicians, Clowns, and Story Tellers around the world have been inspired to higher standards of creative entertainment. This book will inspire you, motivate you, challenge you, and help you to improve your entertainment. Comes with CD-ROM of Adobe PDF artwork for you to make many effects for personal use. Make your own Dead Eye Duck Story, Fastest Card Trick in the World, Captain Chicken, and Magnet Man T-shirt logo.